Daniel de Sosa, creator of the very odd comic Kitty Jenkins: Purrvana (which we reviewed before) is back with another interesting full-color project proposal. This new one is called Kitty Jenkins: A Song of Mice and Fur [You’re a true fan if you get that pun…], and there’s currently a Kickstarter campaign to make it a reality. 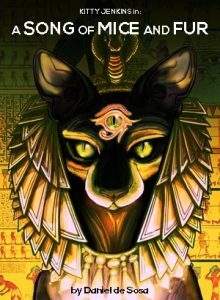 “A Song of Mice and Fur is an absurdist fantasy story set in the realm of Nyania where kitty lords and canine rulers lord over the rodent peasantry. After a surprise Meowgol attack, the fragile peace between the kingdoms of Nyania is broken, and the land descends in to chaos. Red panda mercenaries, authoritarian cats, a sad fat pug and many more all fight tooth, nail and claw to come out on top!” Visit the campaign page to find out more.